A recent report from ComScore indicates that as of July 2011 82 million Americans own smartphones, with Android running on 41.8% of those devices, iOS on 27%, BlackBerry OS on 21.7%, Windows Phone on 5.7%, and Symbian on 1.9%. 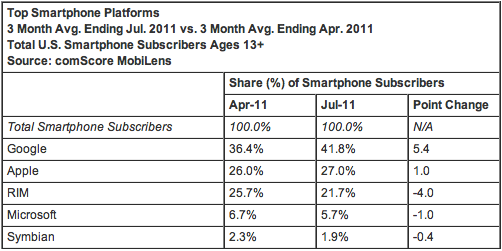 The survey clearly indicates that significant gains have been made by Google and Apple at the expense of RIM, Microsoft, and Nokia. Additionally, the survey also looked at the market share of hardware manufacturers and interestingly Samsung was well ahead of the rest with 25.5% market share. 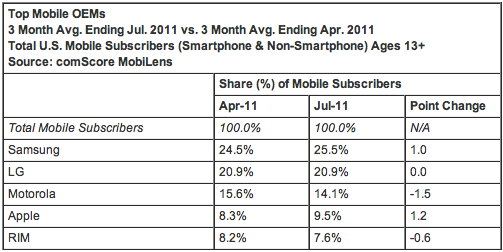 I nearly choked when I first saw this figure as just a month ago Samsung's market share in the US was at a measly 8%. 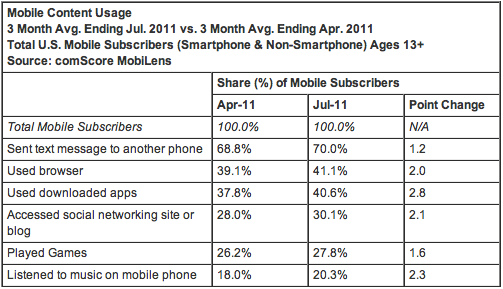 The apparent increase is not an increase at all as for this particular stat comScore surveyed all mobile users in the US, including (presumably) users of feature phones and smartphones. Overall there are 234 million Americans using mobile devices and this is split amongst Samsung, LG (20.9%), Motorola (14.1%), Apple (9.5%), and RIM (7.6%). Although the top three spots are all held by Android manufacturers, HTC is nowhere to be seen. However, this should come as no surprise as HTC is a smartphone specialist. Apparently, no-one makes phone calls any more.